Home > Beginner > My Best 7" x 7"
This primitive type of cross stitch stamped sampler is easy to sew and is good for a young girl as her first step into motif characters.This is a larger stitch printer sampler and basically appeals to beginners or those who prefer a larger stitch. 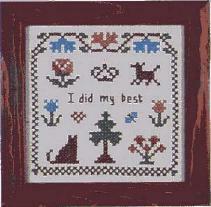 Our normal cross stitch stamped sampler kits are designed 10 to the inch. The Beginner Series is designed 8 to the inch. There is a need for this,as we want to create new sewers and still offer craft stamped kits to those who prefer the larger stitch as their eyesight might have changed Sweet as a beginner's sampler. Lovely designs grow quickly with your needle. I purchased this for Christmas for my 8 year old great niece so that she could learn the wonderful joy of cross stitching. She was so intriqued by it as she has seen me work different samplers, and she couldn't wait to start. The size of the project was perfect for a beginner, and the saying is one we would like all of our young people to learn. She and I were both very pleased.